The plot is owned by the city council, which has been, according to Christophe, very interested and supportive of the project. They were happy to know that there was already a group of people prepared to start working on this space. The city council pays for the work related to setting up the land and also for water, light, a storage container for the tools and some soil to improve the soil profile. “The vegetable garden is self-managed and works as a democratic assembly,” Christophe assured me, explaining that every proposal is voted and approved, and each decision is made together, taking advantage of those who have more knowledge than others in some topics. “There are about 100 people in the group who receive emails and stay informed about what’s happening here, but in the weekly meeting on Wednesdays (at 5 pm) there are between 15 and 20 people,” states Christophe, who has been attending the meetings since May. 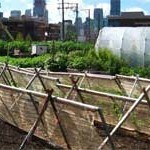 This entry was posted in Whole Earth and tagged gardening, organic food, transition towns, tree planting. Bookmark the permalink.